Iran’s regime has celebrated the 40th anniversary of the Islamic Revolution with declarations of its “missile power”. Defense Minister Amir Hatami unveiled a new long-range cruise missile on Saturday, while the deputy commander of the Revolutionary Guards issued a warning to the “West”. Significantly, Brig. Gen. Hossein Salami aimed his message at the European Union, with whom the Rouhani Government has been trying to establish a vital economic link to bypass US sanctions. “If the Europeans and others want to pursue the missile disarmament of the Islamic Republic of Iran based on a conspiracy, we will have no option but to resort to a strategic leap,” Salami said on State TV. On Thursday, the EU launched a limited version of a Special Purpose Vehicle, permitting non-dollar trade in Iranian oil and other commodities and goods. In return, European countries will provide pharmaceuticals, medical supplies, and food, countering comprehensive US sanctions imposed on November 5. While establishing the SPV, the EU warned Iran against further development of its missiles, used by the Trump Administration to justify last May’s withdrawal from the 2015 nuclear deal between Tehran and the 5+1 Powers (US, UK, France, Germany, China, and Russia). Salami declared that Iran had no technical limits on the range and destructive power of its missiles. He explained that it was Iranian policy to maintain a cap on the capabilities, but warned that this could be removed. “Our defense strategy can change commensurate with the conditions and changes in the behavior of role-players,” he proclaimed. 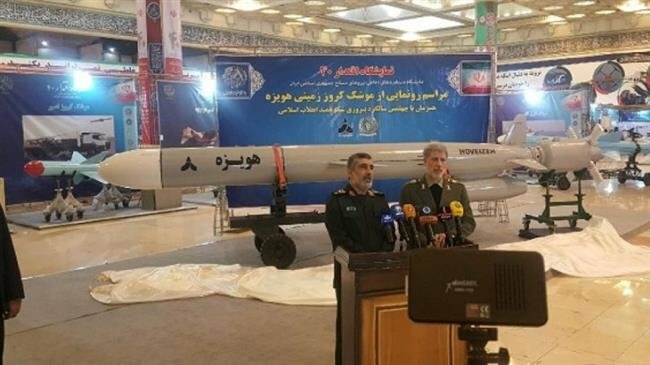 Defense Minister Hatami displayed the Hoveyzeh surface-to-surface missile, named after a southwest Iranian city which was held during the 1980-1988 war with Iraq. This cruise missile needs a very short time for its preparedness and can fly at a low altitude…. The Hoveyzeh missile is the symbol of self-belief and an important defense achievement based on today’s technological progress in the world….No obstacle can hinder the Iranian nation’s determination and will in the defense field. Meanwhile, US diplomats are maintaining pressure on European companies to avoid any links with Iran, including use of the SPV. “There is more passion from our American friends to create problems,” said Michael Tockuss, general secretary of the German-Iranian Chamber of Commerce, last week. Tockuss said at least 20 members of the Chamber have been personally visited by US officials and urged to slow their operations in Iran. Some have been told of their importance to the US-German trade relationship. Others have been threatened with economic consequences if they fail to comply with the American demands. The US Embassy in Berlin is proudly describing a “maximum economic pressure campaign”, building on the tweet of Ambassador Richard Grenell when he took up his position.